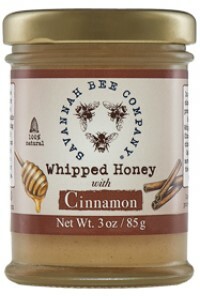 Savannah Bee took their Original Whipped Honey and added some top quality cinnamon that is native to Sri-Lanka and thus created a delicious warm tasting Whipped Cinnamon Honey. Whipped honey is crystallized honey that has air whipped into it, making it smooth, soft and kind of like mousse.The wildflower honey for this product is found in Coastal Georgia and South Carolina. It goes without saying that this Cinnamon Whipped Honey is a delicious match with Cinnamon Rolls, muffins, toast, ice-cream.